I'm part French, took a vacation in France and came away with the opinion that there is nothing as delicious as French food. To me everything I tried was exquisite and unforgettable. In recent years I've tried some of Julia Child's recipes and adapted her boeuf bourguignon (beef stew) - I use less burgundy. So when I heard about this movie and decided to wait for it to come out on DVD I'm glad I did. It was much more cozy to watch it at home. My first impression of the movie was that it was brilliant mostly due to Meryl Streep's mind-blowingly-accurate portrayal of Julia Child's personality. I've been watching The French Chef TV shows and have gained a deeper understanding of her cooking techniques, mannerisms and vocal inflections. Meryl Streep captures something of Julia Child's soul and allows the viewer to fall in love with the idea of Julia Child. Amy Adams is perfect for the role of Julie, she has just enough obsessiveness to get the job done. Making all the recipes in Mastering the art of French Cooking is a formidable task and she has a very small apartment kitchen. Her trials and tribulations, meltdowns and spectacular successes make the movie feel real and lets the viewer ride along with emotional upheavals and disappointments when Judith Jones (a famous editor) doesn't make it to dinner. 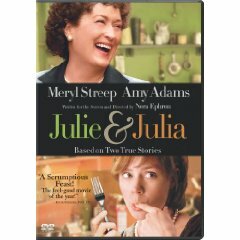 The other upsetting part in the movie is information about Julia Child not liking Julie's Blog. This is devastating to her and she loves Julia Child and wants to meet her. movie made cooking very exciting. As someone who has received a rejection letter from Judith Jones (she writes very nice ones) I felt a strange connection to the story. My cookbook had to be rewritten since she told me my recipe instructions were too truncated - so I changed the entire book. I think she would like the new version that I have published myself. I felt very emotional while watching this movie. It had so many dreams and hopes that eventually become realities. I love very few movies and this one captured me completely.